Over the many years I have visited Canberra, the only restaurants I had ever found to be worth writing about were the ones that only politicians and senior public servants could afford to eat in. But in the last few years it has all changed. Yes, there are still plenty of top-shelf ones around, but at least there are many that are affordable. Most restaurants and cafes feature local produce, which can be enjoyed from an early (or late) breakfast, exciting coffee shops, interesting lunches and imaginative menus for dinner. Local wines also feature on most menus. The region's award winning cool climate wines are now making inroads to the international market and I for one was very delighted in their improvement over the last ten years. On the farm gate trail - just to the northwest of Canberra, at Hall, is a fine example of why Canberra is becoming a 'foodies' destination. Its called Poachers Pantry Smokehouse Cafe. Susan and Robert Bruce began with Poachers Pantry in 1991, a gourmet smoked-meat manufacturer. So much in demand were the products that the opened the Smokehouse CafÃ© in September 2002. Using a fully restored weatherboard farm cottage as a tasting room, a cellar door and a family restaurant. Such is the success of this venture that I was asked to make sure that you know that â€œbookings are essentialâ€. Only open from Friday to Sunday (10am â€“ 5pm), they do more business than some that are open 7 days. I mentioned cellar door sales, on the drive in you pass their Wily Trout vineyard, and even though it was first planted in 1998, they have began to produce some stunning cool climate wines. We sampled and enjoyed their Wily Trout Rose 2005, the 2004 Sauvignon Blanc and a superb Sparkling Red. Jeir Creek WinesOnly a few kms along Gooda Creek Road and Bluebell Lane near Murrumbateman, is another interesting vineyard. Owned by Rob Howell and first planted in 1984, he not only produces 5000 cases of his own wines but is winemaker for 10 of the districts wineries. We found his knowledge exceptional and extremely interesting. Unfortunately, the police were offering free breath analysis on the main road so further sampling was not recommended. 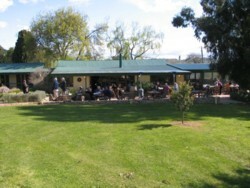 Winery tours, picnic facilities and cellar door sales are available.